India, along with Africa, has the largest tribal population in the world. The statistics are quite astonishing: the 533 different tribes, made up of more than 80 million tribals, represents almost 10% of India's population. The lives of the tribes in India are closely tied to nature, and they inhabit some of the most pristine and picturesque environments in the country. Largely unaffected by the modern world, they're very simple and often curious people, who have retained their rituals and customs. There's much to learn from them! Here are five of the best places to tour tribal India, and get an unforgettable insight into their existence. Approximately 25% of Odisha's population is tribal and the state has more than 60 different tribes -- the largest number in India. These ancient people with mystical ancient ways dwell in Odisha's remote, deep forests and hilly interiors. Most of them are in the southwest part of the state. You'll need to go on an organized tour to visit the tribes in Odisha as some tribal areas are quite inaccessible and require permits, and language is also a barrier. Puri is the best place to arrange tribal tours. Tours run for at least five nights, due to the amount of travel involved. Tours: Heritage Tours operates a 7-day Tribal Wonders tour. Also try community-based Grass Routes Journeys in Puri, which run 13-day tribal trail tours. Desia is an inspiring community-based tribal tourism initiative in the Koraput Valley of Odisha. They offer tours. Alternatively, travel independently and stay at the boutique Chandoori Sai Guest House in the heart of tribal Odisha. Bordering Odisha, the small but cultural state of Chhattisgarh used to be part of Madhya Pradesh. Over a third of its population is tribal, with most of them living in the thickly forested areas of the Bastar region. The tribes are predominantly Gonds, with Dorla, Maria and Muria identities. The Gonds are known for producing beautiful art and having unorthodox marriage practices. Young men and women live together in groups in Ghotul huts and interact freely before getting married. The Dusshera festival is one of the most important festivals of the region and is celebrated in unique style there. Tours: India City Walks conducts an immersive and insightful 6-day Walk With Tribe tour in Chhattisgarh. Alternatively, leading Indian tour company Erco Travels offers a comprehensive 10-day Bastar Tribal Tour including sightseeing in Delhi. If you want to travel independently, stay at Kanker Palace for a regal experience. They organize tours to surrounding tribal villages. There are 16 major tribes in untamed Nagaland, which shares a border with Myanmar in remote northeast India. Whether you venture to the villages just a few hours from Kohima, or to the far-off districts of Mon (renowned for having the last surviving head hunters) and Mokokchung, you're sure to be engaged by the fascinating tribal village life in Nagaland. Many people prefer to take an organized tour, but it's not a must if you're adventurous. The ​Hornbill Festival, held every December in the Kohima district, offers a popular tribal experience. Arunachal Pradesh, with tribes such as the Apatanis from Ziro, is also gaining interest from travelers as a tribal destination. Tours: Holiday Scout, based in Arunachal Pradesh, provides a comprehensive range of tribal tours of various lengths from one day to two weeks across northeast India. Greener Pastures conducts many different tribal tours including an epic 32-day Tribal Frontiers of Northeast India tour through Assam, Arunachal Pradesh, Meghalaya, and Nagaland. The Blue Yonder offers a customizable trip to visit the tribes of Assam and Arunachal Pradesh. Around 15% of Rajasthan's population is tribal. The Bhil tribe, the predominant group, were among the original inhabitants of Rajasthan. They're mostly located in southern Rajasthan, and certain cities are named after their Kings who once ruled there. 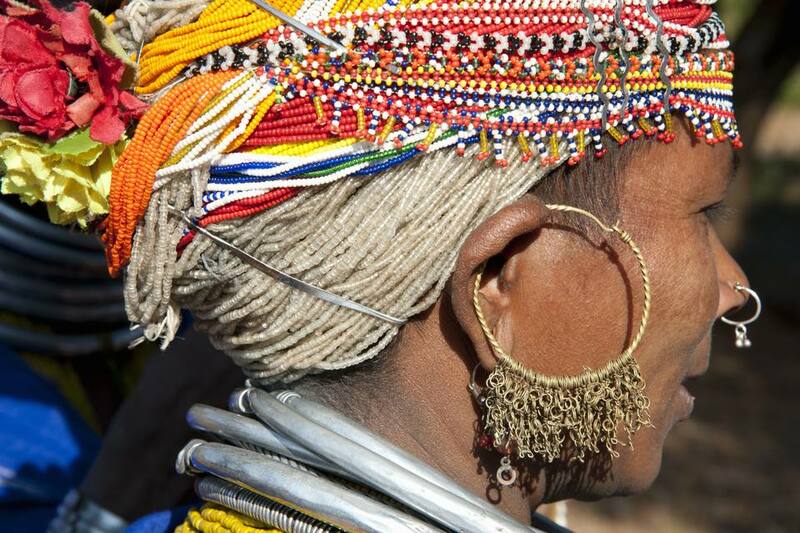 Don't miss the five-day Baneshwar tribal fair, held every January or February in Dungarpur. You can also celebrate the Holi festival in traditional style in Banswara with the Bhils. See them dressed in traditional clothing, carrying swords and sticks, and performing the tribal dance of the region. Conveniently located not far from Jodhpur, Bishnoi village provides an authentic experience of rural Rajasthan. The notable Bishnoi tribe reveres nature and live in harmony with it, so much so that they bury their dead (instead of burning them like other Hindus) to preserve trees as wood is used in cremation. Maharashtra has a large tribal population that inhabits different parts of the state but mostly hilly areas. The main tribes are the Bhils, Gonds, Mahadeo Kolis, Oraons, Katkaris, and Warlis. Like the Gonds, the Warlis are also renowned for their distinctive tribal art. Tours: Grassroutes, a community-based rural tourism venture, runs regular trips to Purushwadi village, home of the Mahadeo Koli tribe. The tribe lives in harmony with nature there, earning a living through farming. The village has just over 100 houses, and the majority of them welcome guests. So, you'll be able to stay with the tribal families and experience what it's like to live in a tribal village. The Mahadeo Kolis are extremely warm and friendly, and will happily continue their regular activities unmindful of visitors. Or, you can join in and help them! Alternatively, you can visit the Warli tribe in Walvanda village with Grassroutes, and participate in a Warli art workshop. Swadesee is another company that conducts regular visits to the Warli tribe.